Mix the water, vinegar, pepper, bay leaves, salt and sugar and put them to simmer. Take out the bay leaves and pepper seeds and let the liquid cool for 10 minutes. 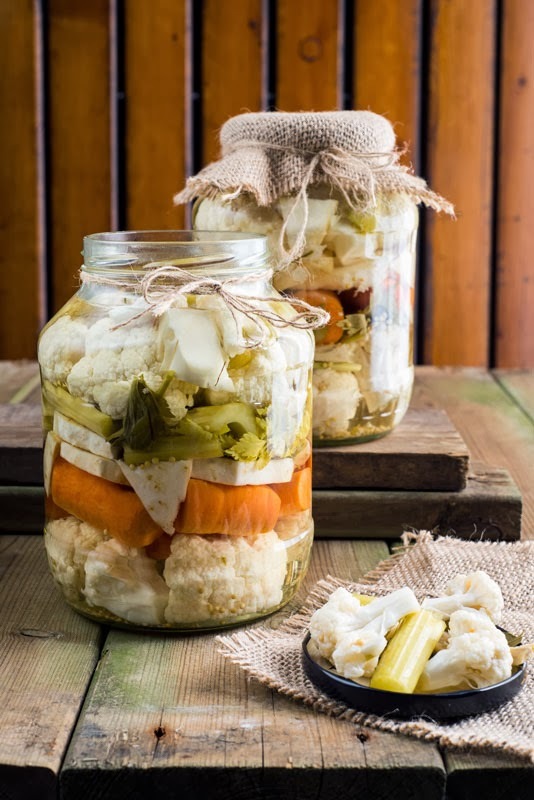 Arrange the vegetables in jars to use as much space as possible. Add mustard seeds and dill in each jar. Put the jars on metal (pots, knives etc) to avoid cracking when you pour the hot liquid prepared earlier over the vegetables in jars. Let them cool until next day and close the lids before deposit them in your cool pantry. They are ready to eat in 1 month.